On Monday I visited the Asian Civilizations Museum here in Singapore to see the exhibition of Moghul jewellery from the al-Sabha Collection. I happened to see the collection in London a few years back but was only too happy to see it again. Words fail! No description can do justice to these superb works of art, every one a masterpiece. However, some of the things in the London exhibition were not on display in Singapore and vice versa. 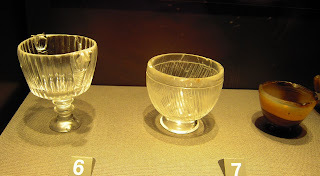 Two objects that I had not seen before and found of particular interest were the small crystal goblets. Flawless, beautifully worked and still unscratched after 1000 years. Of course, I was immediately reminded of the story in the Vinaya in which each of the four Great Kings give the Buddha a rock crystal bowl (selamaye patte, Vin.I,4). This story is intriguing in itself, but it is also evidence of how highly developed the lapidary’s art already was during the Buddha’s time. I know of only one other fine crystal artifact (other than beads) from ancient India, interestingly, connected with the Buddha - the relic casket with the fish-shaped handle from the Piprahwa Stupa (5th-4th century BCE). The two goblets in the al-Sabha Collection are dated approx 12th century although judging by the etchings on the smaller one (7) I would have thought it much earlier. Its shape also speaks of a much earlier period. Whatever the case, it may have been objects something like this, only much bigger, that were given to the Buddha. I know how hard it is to carve rock with a Dremel drill and diamond headed burrs... But crystal! Without an electric drill! And such exquisite workmanship! Just amazing. I have got a question which is completely unrelated to your post, but I didn't find any email-adress to contact you. So, I recently found a quote, supposedly by Buddha, which translates to: If you insight contradicts mine, then follow yours. To me it perfectly makes sense, that he would have said something like that, because following any insights which are not your own is in the best case mindless imitation, in the worst case it is a lie. Obviously it does help you on the path to enlightenment. However, some people claim that this os neither a literal quote by the Buddha nor follows it the spirit of buddhism at all. Do not go along because [thinking] 'the recluse is our teacher'. Furthermore, the sutta has a certain context, Buddha's speech was addressed only to the Kalamer and not to his disciples. The quote you give is one of many falsely attributed to the Buddha. He never said this and I suspect never would have. It looks like one of the numerous distorted or spurious versions of his advice from the Kalama Sutta which are in circulation. The Buddha was enlightened, we (at least most of us) are not, and thus to follow our supposed ‘insights’ rather than consider his, would not be the sort of thing he would recommend. To consider deeply something said or suggested by someone wiser or more experienced than ourselves need not be ‘mindless imitation’. It might be the beginning of giving up a preconceived idea, a prejudice, an unjustified assumption, and moving on to something more reality-based. The Kalama Sutta is not saying that we should just ‘follow our own ideas’ or ‘discover our own Truths’. We unenlightened beings have an amazing ability to be led into comfortable delusions by our desires and fears. What the Kalama Sutta is saying is that the usual means of knowledge are unreliable and that personal experience together with feedback from and the insights of ‘the wise’ is a safer option. However, this fake Buddha quote is a little closer to the spirit of the Dhamma than the usual ‘just believe’ approach encouraged in some religions.